This post continues with the next installment in our series about how GROUNDFLOOR can fit with your savings and investment strategy. Last time, we took on the topic of Diversification. Today, we address one way to think about whether investing in real estate loans through GROUNDFLOOR is a “good” investment. We put that word in quotes because many factors influence whether an investment is good or bad. Different individuals’ needs, goals and life stages will make the same investment a good investment for one individual and a bad investment for another. Ultimately, regardless of fit, it’s always a question of value. In general, an asset’s value is determined by the cash flows it produces and the risk and timing of those cash flows (which impacts the risk). One of the most practical ways to determine an asset’s value is to find an identical or comparable asset, in terms of risk, and see whether that asset offers a larger return (i.e. greater cash flows) than your asset. Alternatively, you could find an asset that is priced similarly to yours and see how the risk compares. So what’s a good comparable for GROUNDFLOOR investments? It doesn’t seem like the stock market is an appropriate benchmark or comparison. After all, value in the stock market is largely driven by a company’s growth potential as well as it’s earnings potential not to mention that you’re investing in equity in the stock market rather than debt. In general, equity is riskier than debt as debtholders are paid before equity investors. Many cite the fact that public equities (i.e. stocks listed on an exchange) allow you to get in and out your investments quickly. While your money is certainly liquid in the stock market, you really need to hold on to your investment for quite some time in order to systematically realize the types of returns that are typically associated with investing in equity. Indeed, stocks are by their very nature volatile--the value can change significantly in a short time period. Are REITs a better comparable for GROUNDFLOOR investments? These investments don’t seem to be any more comparable than the stock market. The most obvious reason being that they are part of the stock market--they are publicly traded equities. Despite the fact that they are real estate, they are most typically--as mentioned above--in a very different position in the capital stack (i.e. when they are paid relative to debt) and they have a very different time horizon as well as exposure to significant volatility. Even for a REIT that invests in debt, however, it’s difficult to know the actual real estate assets that you’re investing in with a REIT. REITs are black boxes. Part of the issue is that real estate, as an asset class has never before been available to all investors--certainly not as (1) a direct investment with (2) the senior position in the capital stack at (3) such an accessible “price point” (i.e. $100 minimum investment). At best it’s been available as an equity investment using REITs, but the comparison to a GROUNDFLOOR investment is questionable. So, what is a good comparison of value? How about traditional savings, money market or certificates of deposit (“CDs”)? CDs might be the most comparable of the three given that your investment is locked up for a defined period of time. Most CDs require a minimum deposit much larger than GROUNDFLOOR’s minimum investment of $100. According to Bankrate.com CDs with a comparable minimum investment and investment horizons from 3 months to 12 months offer annual returns ranging from 0.3% to 0.9% annually versus 8% to 12% annually with GROUNDFLOOR. However, a CD is backed by the full faith and credit of the United States government (up to $250,000), so without question a CD carries less risk. Given that the projected returns on a GROUNDFLOOR investment are 8-15 times greater, the risk would also need to be more than 8-15 times that of a CD for the value of a GROUNDFLOOR investment to be less than that of a CD. So does investing in GROUNDFLOOR offer investors good value? Ultimately the question comes down to your view of the risk-reward tradeoff relative to stocks, bonds, CDs or any other investment opportunity. Do you believe that investing in GROUNDFLOOR loans, consistently, over time will be more than 8-15 times riskier than investing in a certificate of deposit? If no, then investing through GROUNDFLOOR presents good value. 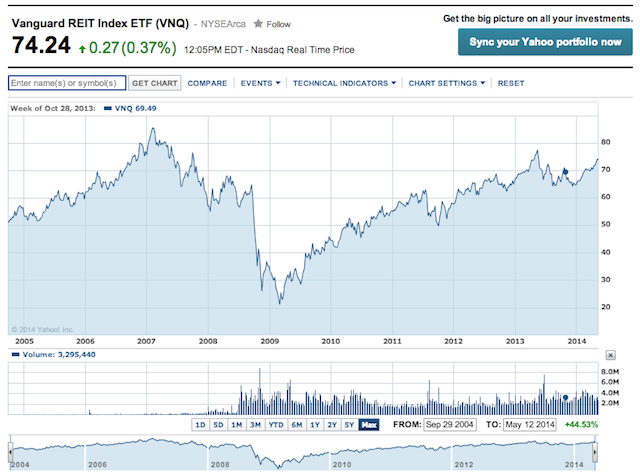 What about REITs? 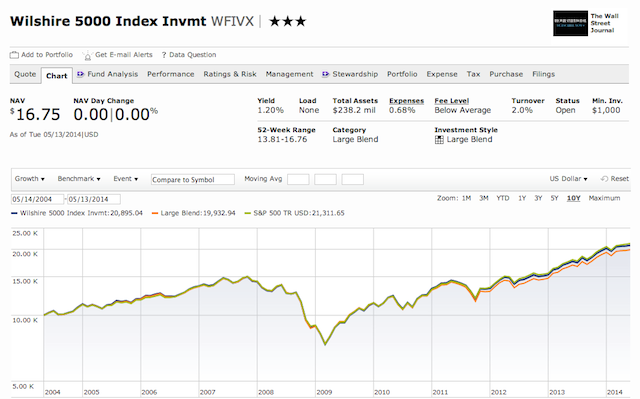 Consider, as an example, the approximate 10-year performance of the Vanguard REIT Index ETF. The ETF returned 44.53% over approximately 9 years and 8 months or approximately 3.88% annually. Do you believe that investing through GROUNDFLOOR is 2-3 times riskier than this ETF? If no, then investing through GROUNDFLOOR presents good value. Finally, what about the stock market in general? For example, consider the Wilshire 5000 Index. This index is widely accepted as the broadest measure of U.S. stock performance (even broader than the S&P 500 and certainly broader the the Dow Jones Index). By this measure U.S. equities have returned 7.41% per year over the last 10 years (as seen in the chart below). However, in order to invest in a fund that mirrors the Wilshire 5000 you will be charged a management fee resulting in annual returns of 6.86%, not the full 7.41%. Do you believe that investing through GROUNDFLOOR is 1.2-1.8 times riskier than the overall stock market? If no, then investing through GROUNDFLOOR presents good value. What do you believe? It may help to consider what it means to have a secured investment in a GROUNDFLOOR loan.